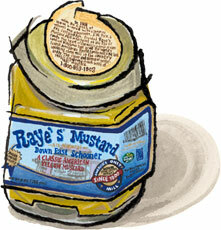 Raye's Schooner Mustard for sale. Buy online at Zingerman's Mail Order. Gourmet Gifts. Food Gifts. A smooth yellow mustard with crystal clear flavors, highly recommended. I think the most interesting part about J. W. Raye’s fourth-generation operation in Eastport, Maine, is that the seeds are ground in a century-old stone mill. It has a series of eight one-ton quartz grindstones that, though I haven’t seen them in person, must be a dramatic sight. As the mustard mash moves from stone to stone it gets creamier without any addition of heat, which would drive off the aromatics and lessen the flavor. It’s put into large barrels and aged about six weeks to balance and deepen its flavor. Then it’s off to us. This is the house yellow mustard for sandwiches at Zingerman's Delicatessen, and for burgers and corn dogs at Zingerman's Roadhouse restaurant. "A velvety yellow condiment with a gorgeous texture and a grown-up piquancy that's not too sharp."